Deep-seated addiction - whether it be to a relationship, a substance or a behavior - isn't going to go away in 30, 60 or 90 days, the length of many treatment programs. Even more importantly, addiction isn’t the core problem. Drugs, alcohol, gambling, eating – they’re all coping mechanisms people use to avoid dealing with unwanted thoughts and feelings. They are methods of escape. The pain that addicts are trying to escape has often existed since childhood. Individuals who experienced trauma in childhood are much more likely to become addicts as teens and adults. The more trauma, the greater the likelihood of addiction. UGM Recovery seeks to address the pain underlying the addiction and provide healing for the whole person. After an initial educational assessment, residents work to overcome any barriers to meaningful employment. Individualized instruction encompasses literacy training, GED testing, computer skills and college prep. Toward the end of the recovery program, residents participate in a business practicum experience – 240 hours of unpaid employment – to sharpen their job skills and rebuild their work history. Cognitive therapy with a biblical base is supplemented by individual and group counseling. While UGM attempts to provide all the resources necessary to address addiction’s underlying causes, only Christ can transform a life. Bible study, prayer, chapel and worship are integral components of UGM Recovery. All participants live on site and engage in community, learning through the give-and-take of relationship. Each individual receives a health and wellness check upon entering recovery, as well as assistance with smoking cessation, diet and exercise, and ongoing medical needs. A fitness area is available at each recovery location. 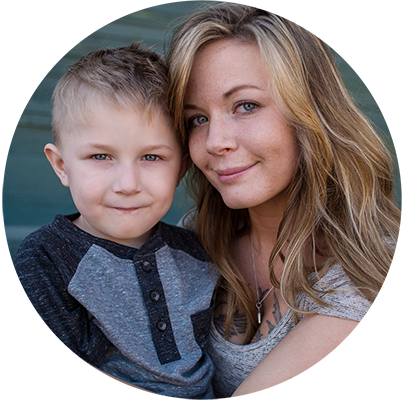 Click here to see how lives like Amanda's are changed at UGM. Each four-month phase offers one-on-one guidance and counseling, classes, chores and recreational outings. Courses differ between men’s and women’s programs and include Bible Study, Money Management, Search for Significance, Boundaries/Beyond Boundaries, Understanding Addiction, Genesis Process, Healthy Relationships, Health and Fitness, Quest for Authentic Manhood, Every Man’s Battle, Pathway to Purpose, WorkNet, a business practicum, and hands-on work to develop academic and computer skills in the Voc-Ed Center. Clear mind of drugs and alcohol; begin to trust others; identify healthy relationship boundaries; live in community; explore relationship with God and His power to bring change; admit underlying problems and powerlessness to change. Dive deeply into relationships and past wounds; learn advanced recovery tools, relapse triggers, conflict resolution, and healthy alternatives; examine the meaning of identity in Christ; explore aptitudes and dreams with regard to finding meaningful work and being a valuable employee; compose an accountability team and support outside the Mission community; begin developing plans for Phase 5. Transition/restoration; pursue or maintain work/school/church; reside in community outside UGM shelters. UGM holds a yearly commencement, celebrating the men and women who have finished all five phases of the recovery program and returned to society as contributing members. Interested in entering the program? Click here for more information about UGM Men’s Recovery. Click here for information about Women’s Recovery. While they might finish the recovery program, nobody “finishes” their recovery process. Lifelong recovery must be continually nurtured and pursued. UGM is committed to walking alongside people in recovery for their long-term wellbeing, whether they’ve been through our programs or not. Click here for more information. Trauma in a woman’s life spills over into her child’s life, resulting in disruptive behaviors, anger and various other disorders, including reactive attachment disorder and oppositional defiant disorder. UGM provides the first safe, stable home many of these children have ever known. Women’s Recovery also features a children’s recovery program, specifically tailored to the needs of emotionally damaged children. Through counseling, training, and hands-on support, moms learn how to love, discipline and communicate with their children in healthy ways. At the same time, children grow in their ability to set boundaries, process the trauma they’ve been through, express their emotions, ask for what they need and experience what it’s like just to be a kid. welcomed into our recovery programs. finished the full recovery program and returned to society as contributing members.